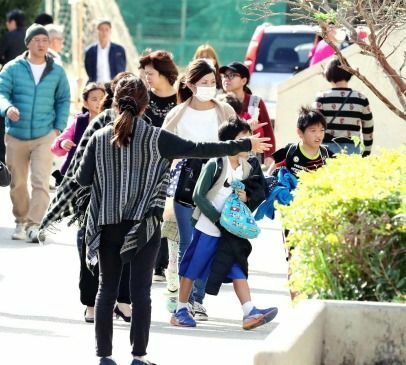 After noon on December 13 at Futenma Daini Elementary School in Ginowan City, pupils leave school with their parents and guardians in the wake of a crashed U.S. military helicopter’s window falling onto school grounds. On December 13, an object reflecting white light was visible falling from the sky. With a crashing sound a cloud of dust whirled about and U.S. military helicopter fragments flew into the air. A window from this aircraft slammed down right in the center of Futenma Daini Elementary School’s sports field in Ginowan City, Okinawa. The point where the window fell was ten meters from the nearest child. Pupils were shocked and afraid, and their parents and guardians are adamant that they do not want aircraft flying in the sky above the school. This occurred during second period, in the middle of the school day a bit past 10:00 a.m. when second-year and fourth-year pupils are engaging in physical education. The second-years were playing ball, the fourth-year boys were jumping rope, and the fourth-year girls were practicing horizontal bar exercises. Since the field was divided in half to keep the second- and fourth-year pupils separate, the middle of the field was not being used. One of the school’s office staff who was on the second floor said that the sound of the aircraft was different from normal, expressed a sense of unease upon hearing it, and went to a window to look out. For a moment there was white light reflecting off an object in the air. A fourth-year boy was hit in the arm with some fine dirt thrown up from the impact, and went to the school infirmary. Once the children took refuge inside the school building, some burst into tears recalling what had just happened. Okinawan Prefectural Police restricted access to the school. A somber feeling hung heavy in the air as a CH-53E helicopter, the same type of craft as the one that had just crashed, flew around above the school. Afternoon classes were cancelled under the circumstances, and the parents and guardians were informed to come pick up the children. Parents and guardians arrived with grim expressions, and most left hurriedly. The grandmother of one fourth-year female pupil who was in the schoolyard came to pick her up right when the crash occurred, and left with a stiff countenance. A 9-year-old third-year pupil said as he left through the school gates: “There was suddenly an announcement broadcast to those of us in the classrooms. It said that an aircraft part fell onto the sports field, and that we weren’t allowed to go outside even for break. It’s scary. I wish the U.S. military would be a little more considerate of Okinawa’s kids. However, they said their teacher had instructed them not to talk about it except for with their families, and did not speak about the event any further.